The Obelisk of Distances was erected in 1818 as an official starting point for measuring all the road distances in New South Wales, and it continues to perform this function today. It was erected by Governor Macquarie in what was then the geographic central point of Sydney. 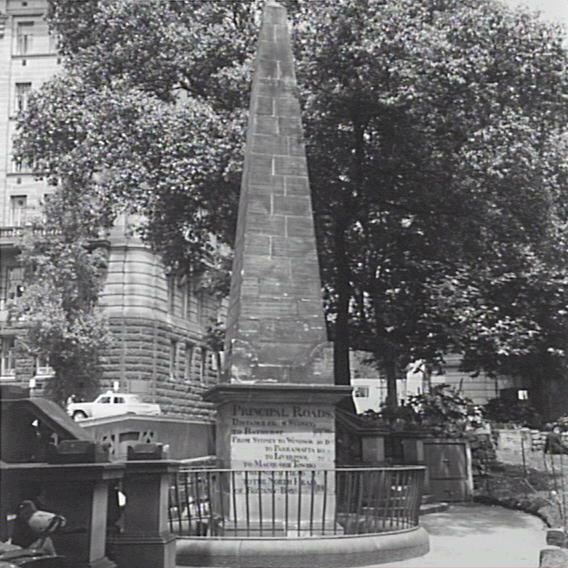 The Obelisk was designed by convict architect Francis Greenway and is apparently the earliest surviving monument in the colony, probably built by convict labour. The once prominent position of the Obelisk has been eroded over time by the encroachment of roads. The monument was originally surrounded by a wall which had design elements reflecting those on the Obelisk itself. Minor conservation works have been implemented throughout the years starting as early as 1895-1901. In 1916 repairs were undertaken, including work on the ornamental steps and the stonework surrounding the monument. In 1966 repair work followed damage caused by a motor vehicle. The State Heritage-listed monument underwent extensive restoration work between 2007-2009. Restoration works in 2007 rectified the subsurface drainage to ensure there was no pooling of water below ground that is then drawn up into the stone causing damage. 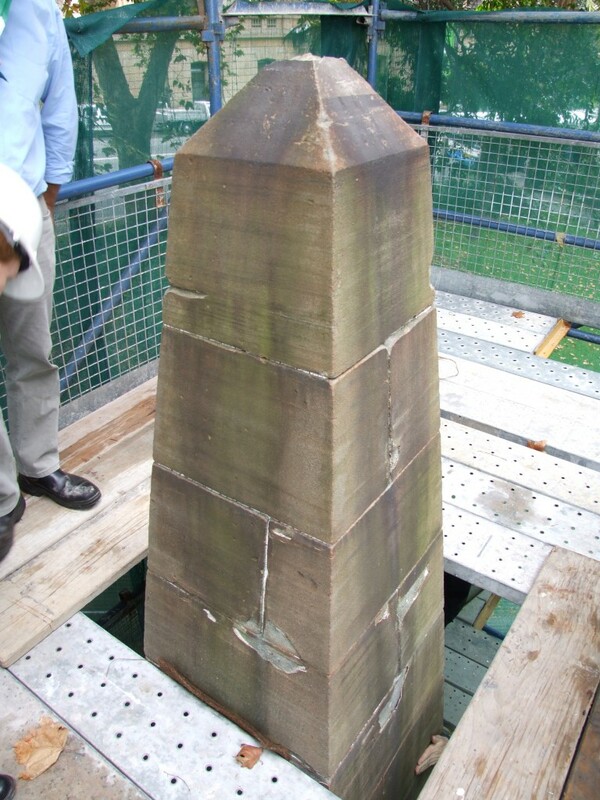 The treatments in 2009 sought to preserve the monument whilst maintaining the integrity of the original object and its historical material. This work stabilized the condition of the sandstone and wrought iron elements and improved the legibility of the historic inscription. Old pointing was removed and replaced with sound lime based mortars to keep water out of the monument. The sandstone was consolidated to strengthen the stone and to slow weathering. The work included re-attachment and grouting of all stone detachments across the whole monument and surrounding wall. The treatment also included cleaning, biocidal treatment, coating reduction, toning of bare stone surfaces and desalination.